Laurel really knows her trees. 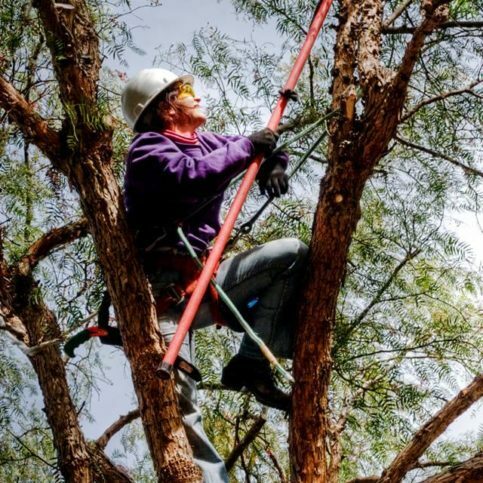 She's an expert arborist, and she knows how to take care of trees. They were on time, they did the work, they cleaned up after themselves, and the contractors were quick and prompt. There were no problems, quick, efficient and well-done. She is good, and she has comprehensive knowledge. She is responsive to communications. I would say they do a good job. They have a little bit of administration problem and can't get someone to stay, so in terms of billing, they're not so great. Their personal service, and they are hardworking. Laural Roaldson is Chief Organic Officer of Laural Landscapes. 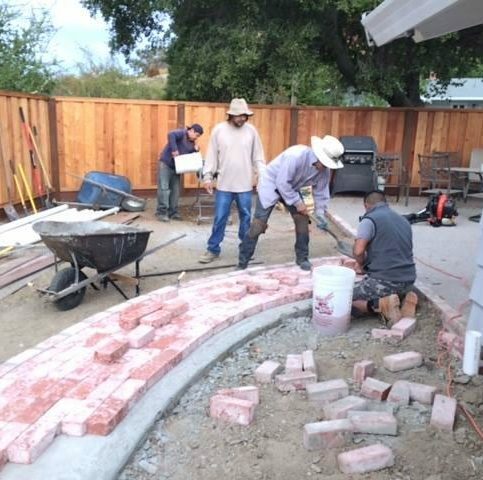 Laural Landscapes, Inc. provides landscape design, installation, and maintenance services for residential and commercial clients in Contra Costa and Alameda Counties. 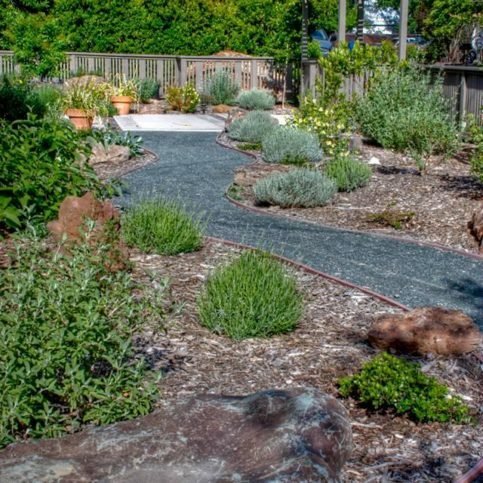 The company’s wide-ranging capabilities include everything from aesthetic pruning and seasonal planting to irrigation analysis and rainwater harvesting, and owner Laural Roaldson can also accompany customers to local nurseries and rock yards and help them choose plants and boulders that are best suited for their landscapes. DIAMOND CERTIFIED RESEARCHED CAPABILITIES ON Laural Landscapes, Inc.
Company Name: Laural Landscapes, Inc.
DIAMOND CERTIFIED RESEARCHED ARTICLES ON Laural Landscapes, Inc.
Laural Landscapes has been providing landscape design, installation, and maintenance services for residential and commercial clients in Contra Costa and Alameda Counties since 1988. The company has the training and equipment to handle everything from aesthetic pruning and seasonal planting to irrigation analysis and rainwater harvesting, and it can also help clients choose plants from local nurseries. Q: Do you use weed block to control weeds? A: No. Weed block isn’t a good long-term solution—it starts disintegrating within two years, at which point you have to deal with weeds and the residual plastic. Instead, we recommend sheet mulching once a year, which is a more natural way to curtail weed growth. Q: Can you help me select plants that are safe for my kids and/or pets? A: Yes, we’ll avoid installing any plants that could be toxic to children or animals if ingested. If you want a certain plant that’s been deemed unsafe, we can help you find a comparable variety that doesn’t pose a risk. Q: Can you work with my existing plants? A: Absolutely. Working with existing plants is a great way to save money on your landscaping project. If necessary, we can relocate plants to other areas of your yard to fit the new design. Q: How can I keep deer out of my garden? A: The two best options are installing a deer fence or applying something to the plants that gives off a terrible odor. Since you’ll have to live with the latter option, we usually recommend installing a permanent or temporary deer fence. Q: Can you provide a water-wise alternative to a conventional lawn? A: Yes, we can install a ground cover that offers the same aesthetic qualities as a traditional lawn but requires a lot less water. Q: Can you design my garden to attract beneficial animals and insects? A: Yes. We can install plants that attract the wildlife you want to have around, such as birds and pollinators like bees, butterflies, and hummingbirds. SELECTED PHOTOS FROM Laural Landscapes, Inc.
Laural Landscapes offers gardening classes on a variety of topics. 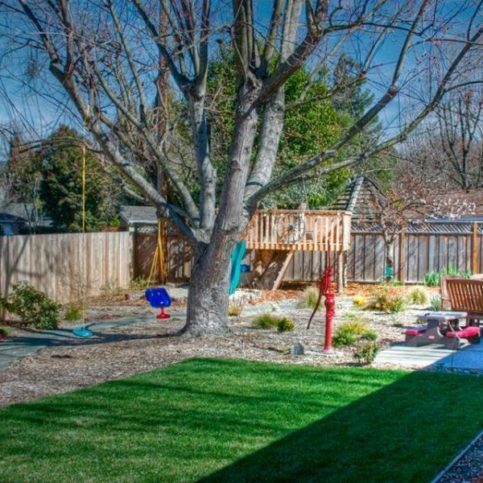 Laural Landscapes installed a low-water lawn in this family backyard. Owner Laural Roaldson prunes a customer’s pepper tree. A Laural Landscapes technician cleans up after working on a customer’s tree. This backyard project features lanterns and a redwood deck. For this project, Laural Landscapes focused on high color and low-maintenance curb appeal. 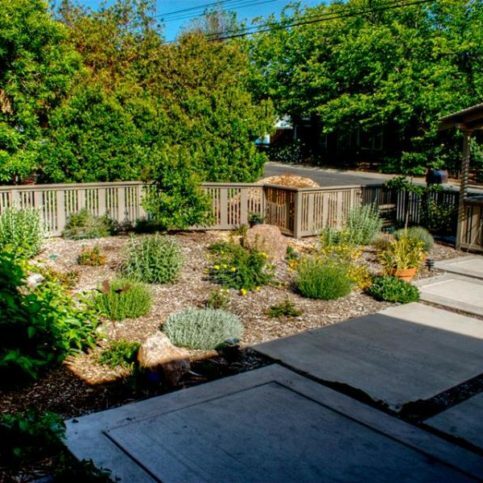 This chaparral garden features a winding, decomposed granite path. Laural Landscapes technicians lay out a running pattern on a brick wall. 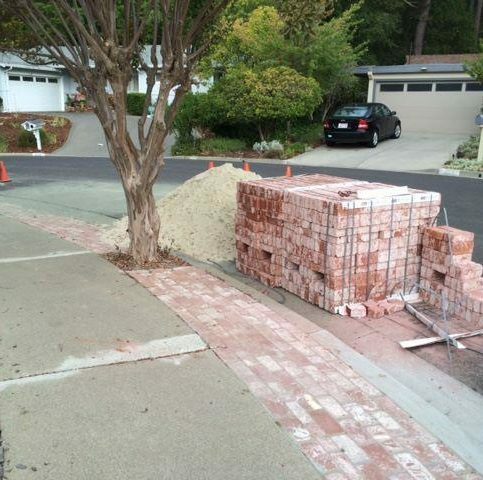 Jobsite safety is important to Laural Landscapes. 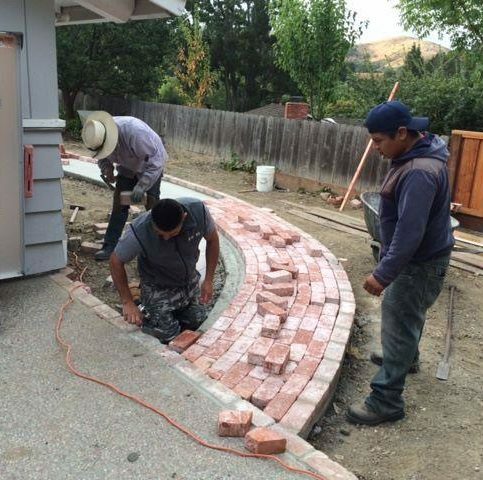 Laural Landscapes believes in the importance of brick placement. 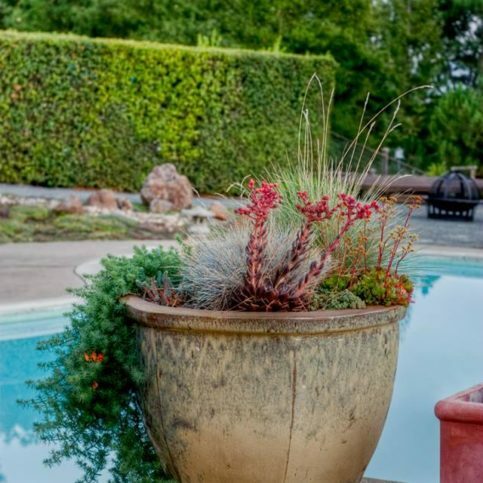 Laural Landscapes planted succulents and grasses in this poolside flowerpot. Laural Roaldson is a 22-year veteran of the landscaping industry and owner of Laural Landscapes, Inc., a Diamond Certified company. She can be reached at (925) 350-6444 or by email. 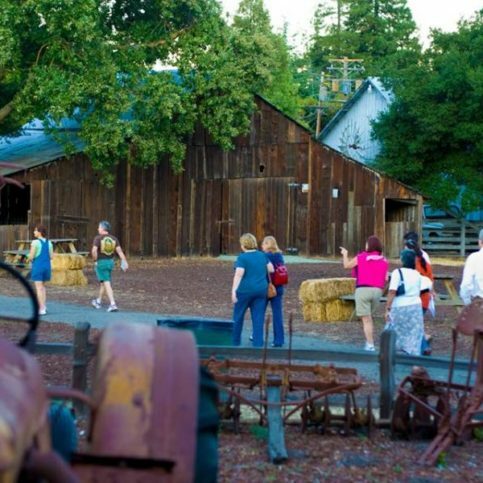 Laural came to the Bay Area in 1998 and resides today in Concord. Outside of work, she engages in a variety of active and artistic pastimes. “I love performance art like live music and theater, but I like going to the movies, too,” she says. “I also enjoy music. I like to sing, and I’ve written a few songs.” Additionally, Laural enjoys activities like camping, swimming and spending time with her daughter, Amy, who is currently a business major at Cal Poly in San Luis Obispo. A: I’d like to go to South or Central America, just to see a rainforest in person. A: That’s a tough one, but I’d have to say the valley oak, just because of how big, old and enchanting they are. A: Watch a movie…or the rain itself. A: Swagat Indian Cuisine in Concord. Do you want to grow food? 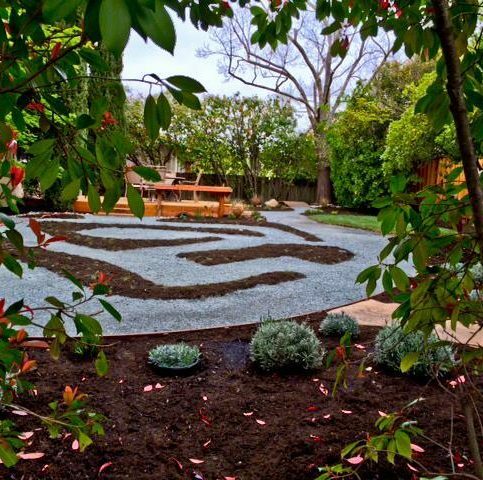 Enhance your yard’s aesthetic value? Create a sight or sound barrier? Attract animals (or repel them)? Knowing your purpose will help you decide which plants will best fulfill it. When selecting a plant, be sure to consider its mature size. For example, a Coleonema may look cute as a seedling, but it’ll grow to three feet tall and six feet wide, so if you don’t want that large of a plant, pick something else. Is the plant evergreen or deciduous? If it’s the former, you’ll have something you can enjoy all year; if it’s the latter, it’ll be dormant for part of the year, so make sure this works for your overall design. Consider a plant’s irrigation needs and how you’re going to fulfill them. How much water does it need? Will you use drip or spray irrigation, or another method? If you don’t have an adequate means of irrigating the plant (or simply don’t want to increase your water bill), you’re better off choosing a drought-tolerant succulent. Find out how much maintenance a plant requires and decide how much time you’re willing to invest in it. Are you going to maintain it yourself or do you have a gardener who will do it for you? WALNUT CREEK – There are a few ways to inhibit weed growth in your garden, but just like other areas of landscape cultivation, the best methods are organic. One such method is called sheet mulching, which effectively blocks weeds without relying on chemicals or synthetic materials. The first step of sheet mulching is to lay down cardboard, which will serve as your base. With each piece of cardboard, there should be at least a few inches of overlap (a foot is ideal) so as to leave no open seams where weeds can emerge. This cardboard base provides a couple of advantages: besides blocking weeds, the corrugation will attract worms, whose presence will help enrich the soil. Additionally, since cardboard naturally decomposes, you won’t have to deal with residual materials in the soil as you would with a fabric or polyethylene weed barrier. After your cardboard is in place, cover it with a layer of mulch (bark, wood chips or a similar organic material). Your mulch can be anywhere from 2 to 12 inches deep, with greater depths recommended where weeds are especially aggressive. Since the point of the mulch is to suffocate the weeds and cut them off from sunlight, deeper is always better. As a biodegradable, soil-enriching technique, sheet mulching is an ideal solution for blocking weeds. Keep in mind that since mulch decomposes over time, you’ll need to reapply it each season. However, since this is both easy and inexpensive, it’s well worth the effort. WALNUT CREEK – Knowing how to prune a tree is important, but it’s equally important to know what to prune. The simplest way to approach this is to look for branches that fall into one of the following categories: dead, dying, diseased, deranged or de-located. By remembering the five D’s, you’ll be able to prune for maximum tree health and beauty. While dead and dying branches are easy to recognize by their dark, dried-up appearance and texture, a diseased branch can be a little trickier to identify. For example, “fire blight” is a common disease that affects pome fruit trees (pear, quince and apple, among others) and is manifested by a burnt appearance on leaves and branches. In most cases, if a branch exhibits an unhealthy appearance (especially in contrast with the rest of the tree), it’s probably best to get rid of it. A “deranged” branch is merely an unsightly branch whose presence detracts from the aesthetic beauty of your tree. Lastly, a de-located branch is one that’s rubbing and crossing another branch. Over time, this continued contact can damage both branches by abrading the bark and leaving them more vulnerable to disease, so it’s best to eliminate any de-located branches you come across. WALNUT CREEK — Host, Sarah Rutan: When choosing plants to put in your garden, it’s helpful to have criteria on which to base your selection. Today we’re in Walnut Creek with Diamond Certified Expert Contributor Laural Roaldson of Laural Landscapes to learn more. Diamond Certified Expert Contributor Laural Roaldson: How do you decide what to plant? There are 5 things. The first thing is: What’s your end goal? Do you want this to be a barrier? Do you want it to be a screen? Do you want food? Do you want to attract animals? Do you want to repel them? Do you want it to be a sound barrier? The second thing is: What is the mature size of the plant? This darling coleonema is going to be 3 feet tall and 6 feet wide. So, where you plant it now might look cute, but then 2 years from now, nah, maybe not. The other thing is: Is this plant going to be evergreen or deciduous? What do you mean? “Evergreen” means it’s going to stay green. All year long you’ve got something to look at. Deciduous plants, these other ones, go away, or partially go away. They have a dormant period. So, you’re not going to see much. The fourth thing is: How are you going to irrigate these plants? Can you irrigate them? If you can’t, you need drought-tolerant succulents. If you can irrigate them, is it going to be Netafim? Is it going to be drip? Is it going to be spray? And how much water is that going to take? You’ve got to think about that. The fifth thing is maintenance. Who’s going to maintain it? Do you have time to maintain it? Are you going to get somebody else to maintain it? Is it a picky plant that they’ve got to know what they’re doing? Or is it a low-maintenance, easygoing plant? So, think about that, too. Those are the 5 things you want to think about when you’re deciding how to choose a plant. 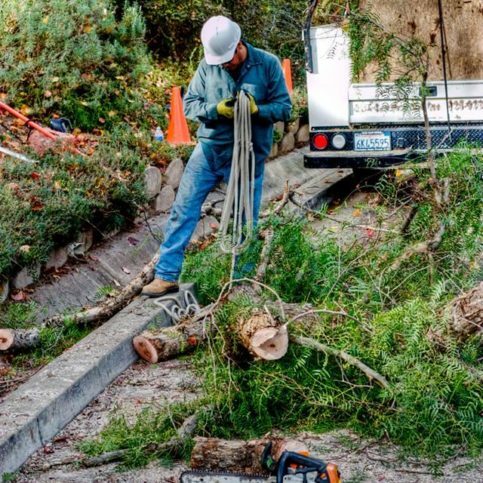 WALNUT CREEK – Host, Sarah Rutan: When it comes to pruning trees, besides knowing the correct technique, it’s important to know what to look for. Today we’re in Walnut Creek with Diamond Certified Expert Contributor Laural Roaldson of Laural Landscapes to learn more. Diamond Certified Expert Contributor, Laural Roaldson: We’re going to talk about basic structural pruning. And that’s the five Ds. You have dead, dying, diseased, delocated (which is rubbing and crossing), and deranged. So, this one I previously cut, it was a little bit of fire blight. Just a little. I’m not positive it’s fire blight, but in case it’s fire blight, it’s better to just get rid of it. So, we cut twelve inches below, and that’s what that is. Now, a dead branch would be this one. This is dead. That one’s dead. And you can tell by the color of the wood. Dead, dying. This is dying. On this branch, this one is dead. This one is alive. There’s a little bit of green in there. You can see it. So, in order to keep the rest of these two branchlets healthy, we’re going to take this off. Okay. Dead, dying, diseased. We got the diseased one. Deranged, which is kind of a crazy-looking branch. This one right here. Let’s cut that one off. And then delocated. It is rubbing and crossing. So, rubbing and crossing, see. Those two I cut earlier were rubbing and crossing. And I think we got the rest of the rubbing and crossing previously. This branch over here is dead. Even though you go, “Oh, I don’t want to take that whole branch off,” but you’ve got to if it’s dead. So, you want to position your shears properly, your Felcos, whichever you’re cutting with, properly. You want to have a nice seat on the branch bark ridge. Don’t go too deep into the wood. Otherwise, whatever is left doesn’t have the right stability. So, you want to cut on the branch bark ridge. And cut so that you’re going to get a nice clean cut. See? And now the tree is going to be happier. Because it only has on it what it can sustain and what will help it to be healthy. 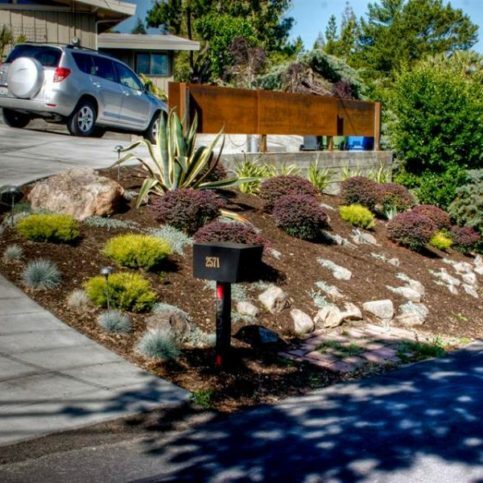 WALNUT CREEK – Host, Sarah Rutan: If you’re looking for a chemical-free way to inhibit weed growth on your property, sheet mulching may be just the thing. Today we’re in Walnut Creek with Diamond Certified Expert Contributor Laural Roaldson of Laural Landscapes to learn more. 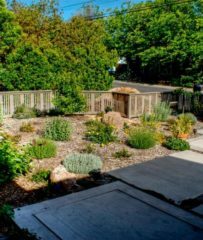 Diamond Certified Expert Contributor, Laural Roaldson: When I got here, this backyard was full of nothing but weeds. And they were pretty tall. And I decided, “We’re going to sheet mulch this.” I wanted to get rid of the weeds, but I didn’t want to use any chemicals. So, what we did was we laid down cardboard. Any cardboard will do. You want to overlap it, so, you have no seams that are open. You want it overlapped, by, like, about a foot would be great, but at least a few inches. Then you put cardboard. Excuse me, then you put mulch on top. And the mulch can be any mulch that you choose. I choose chipper trash, which is free. I get it from tree care companies that they don’t have to take it to the dump. And that saves the dump, more space, and I get a fabulous wood product that works great. What it does is you have the corrugation of the cardboard attracts worms. They lay their eggs in it. So, you have worm condos. And then the worms are busy. They’re busy doing the tilling of your soil for free. Then on top of that, you have your cardboard. Excuse me, on top of that, you have your mulch. The mulch can be at least two inches, but up to twelve inches, depending on how pernicious your weeds are. Like, if you’ve got Bermuda grass, you want twelve inches of mulch. It seems like a lot, but it’s important to have that much so that you can suffocate the weeds and stop photosynthesis. The more mulch you have, the better off you are. So, as the mulch is sitting here, it’s retaining moisture in the soil for you for free. It’s retarding weed growth for free. And as it breaks down, it feeds your soil for free. It’s a win-win-win situation. So, that’s why I recommend sheet mulching. Diamond Certified RATINGS ON Laural Landscapes, Inc.
Laural Landscapes, Inc. : Average 8.3 out of 10 based on 36 unique customer surveys of customer satisfaction. I thought that Laural listened to us and what we wanted. She found a way to make that happen perfectly. The very best thing is the results. I mean we have these beautiful gardens. She comes highly recommended. She does an excellent job, and she's a likable person. The quality of their work, they're right on top of it. Laural and her assistant are very easy to work with and very knowledgeable about plants. The whole experience was very positive. She's very talented, and she listens really well. She's very creative and good, all good things. I think she has good ideas. She's hardworking and focused on meeting my needs. She's great. I love their concept on conservation and using the natural environment, but it was a bit pricier than I personally could afford. They were very responsive, very nice people, and I loved the work they were doing using the natural landscape and trying to preserve that. I liked Laural. She was conscientious about the environment, and I liked her energy and everything about her. Her focus was really good in terms of Green gardening. I really liked her, and I would work with her again. She is knowledgeable, helpful, and enthusiastic. She has a good sense of design. They did a great job, and they cleaned up. It looks good, and they finished it in the time they said they would. They came when they said they would, and they did what they said they would do. They cleaned up, and it was a nice, neat job. They give good service, and they know what they are doing as far as taking care of plants. Laural is very honest and does her best to satisfy what it is the customer is looking for. She got the job done in a timely manner. Her crew is just the nicest, most polite, and cleanest guys. They are so friendly, and Laural knows that. I love them all. How she worked with me. I sort of knew what I wanted, but I didn't know how to make it happen. She took my ideas and ran with them. Great customer service and good expertise in her field and line of work, so she knows what she's doing. I would say she knows what she's doing, and I would certainly suggest that you talk to her. That they have, or she has, a very very extensive knowledge of planting. She has the ability to select the appropriate plants for a specific design goal. The relationship, her thoroughness, plus just the relationship with her as a person, the working relationship was good. Very pleasant to deal with, very tolerable, and they love my dog so much that I think they're coming to see my dog instead of to do the work. They're very clean, they're here when they're supposed to be, they cleaned up after themselves every day, and they didn't leave a bunch of messes for me. I could use my yard if I wanted. They're just very pleasant to work with and very helpful. They've just been very helpful to me. I don't know if its me or my dog. When I call with questions, she gets back to me. She's been responsive. They've just been very helpful. They understand the difference between native California plants and weeds. They are pleasant and easy to work with. They're efficient, and they do a good job.